DMC provides Stone Cleaning Services to all types of stone buildings. These type of buildings need a lot of care and attention when they are being cleaned by any cleaning company. It’s important you consider finding a company with experienced cleaners to ensure the best results with no damage. DMC will provide a perfect method of cleaning on your stones with experienced and trained staff. Whether its granite, sand stone or lime stone or another stone, we are able to supply the correct method on which to remove the dirt and grime without damages done to your building. We are able to clean all types of exterior stones with our Stone Cleaning Service. We have experts that know how to handle any dirt. There are so many organic matter and pollution which can show on your exterior stones. There are so many options you can choose to remove dirt from your stones effectively, safely and gently and we have the expertise. DMC is able to provide high level cleaning to access large buildings. We use scaffold, platforms and mobile access platforms. Each building we clean needs a completely different set up when it comes to reaching the high places. We will reach all levels of your building, making your whole building equally fresh and clean. 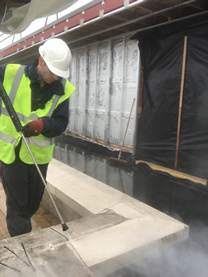 If you would like more information on our Stone Cleaning Services, or would like a free no-obligation quotation, please Contact Us on 01525 500100.